Looking for a heavenly seafood creation with an Asian twist for your guests? 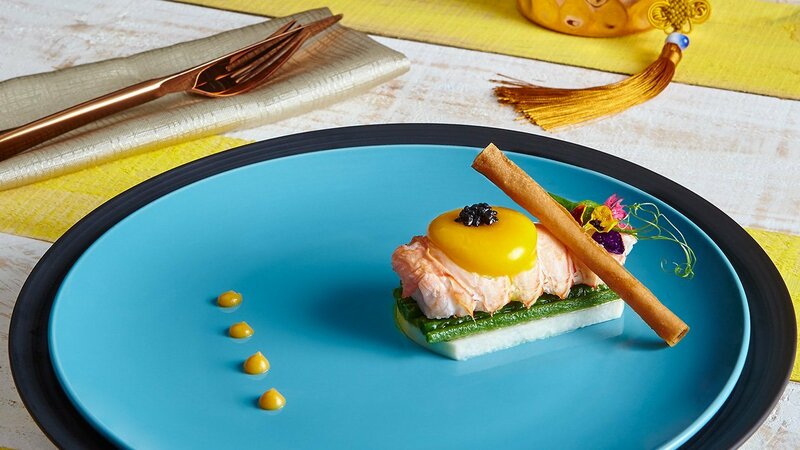 Look no further than this recipe of lobster chucks coated with Knorr Golden Salted Egg Sauce golden lava. Certain to deliver an unforgettable taste of the sea. Golden Dragon Method: (Sous Vide Cooking) Place lobster meat in a vacuum bag, add Knorr Basic Stock Reduction and place it in a Sous Vide Cooker. Cook at 68°C for 30mins. Play with Pearl Method: (Salted Egg Golden Lava: Roast egg yolk in olive oil at 62°C for 15 mins, set aside for later use.) Melt butter in a pan, add Knorr Golden Salted Egg Powder, Knorr Chicken Seasoning Powder, evaporated milk and sugar. Bring to boil and transfer the sauce into a cooking syringe. Slit a tiny opening on top of the egg yolk, use a cooking syringe to remove the filling and inject the sauce into egg yolk. Blanch turnip and green beans. Heat up some oil in a pan, sauté turnip and green beans till fragrant, season with Knorr Concentrated Chicken Bouillon. Plate turnip, green beans, lobster meat, salted egg golden lava in mentioned order, top with caviar, scatter deep fried spring roll skin on lobster meat, garnish with edible flowers. Ready to serve.